East Ogwell, Near Newton Abbot. I cover all aspects of dog training. Small friendly puppy classes, private one-one lessons, recall workshops, scent & trick training, training walks, scent work and home visits. Residential Training – why not combine your dog’s holiday in our boarding kennels with some training while he is here. Whether you have an adult dog, a rescue dog, a puppy or just want to provide some fun and mental stimulation for your dog we have classes to suit everyone. Give me a call on 07702122042 or head over to our contact page. I am an accredited, qualified IMDT trainer and only use kind, positive training methods. I am passionate about dogs and dog training and my aim as a trainer is to provide clients with the knowledge and practical skills needed to have a happy and successful life with their dog. I first became qualified as a dog trainer in 2002, however I have worked with people and their dogs since 1983, looking after peoples pets in my boarding kennels so I have years of experience with all types and breeds of dog. I am an accredited and qualified trainer, being a full member of the Institute of Modern Dog Trainers which means I have undergone a rigorous assessment process to meet the high standards expected of an IMDT member and abide by a strict code of ethics to ensure both Owners and Dogs training needs are met in a positive and effective way. I continue to regularly attend workshops, seminars, talks and training courses to expand my skill set and keep my knowledge current. You can find out more about my academic qualifications and courses I have attended under the ‘about me’ section. All the content of my training classes has been developed through years of knowledge and experience and all training methods are reward based, which is positive, kind and highly effective. To find out more about me Click Below! Its Christmas time, there’s no need to be afraid. (but you do need to be careful). Just completed four 1:1 training sessions with Caroline, we've learnt so much in such a short space of time. The lessons were really enjoyable for me and my little dog Teddy and Caroline has given us loads of great advice and techniques to work with. Thank you! I would strongly recommend Caroline’classes. First of all her love for dogs is obvious and her knowledge invaluable. This was all new to me and I was really nervous. Caroline was recommended to us and I’m so glad we went! We started with 1:1 puppy class when my puppy was 10 weeks , went on to do a group one and then a further group continuation class so you could say we enjoyed it! Learned so much that we can practise on our own and Caroline follows each class with factsheets and is always open to questions! My energetic cockapoo Bruno has really benefited from the class and it has helped us bond even more. Oh and the last class was a hoot! Going to miss it! We have attended a puppy class, continuation class and a scentwork class with our puppy Phoebe and we have all really enjoyed it. 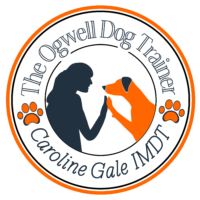 Caroline is very knowledgeable and passionate about dog training, and all of the classes have been really valuable to us. We have come from not knowing anything about dog training, Phoebe being our first puppy, to feeling really confident in our ability to raise a well behaved and happy dog! Phoebe loves the classes too and gets very excited when she knows where we are going! We can not recommend Caroline’s training enough, and we hope to continue with more classes in the future! Thank you! I cover all aspects of dog training. Small friendly puppy classes, private one-one lessons, recall workshops, scent & trick training, training walks scent work and home visits.